We are on the hunt for your favourite farm apps and why they make a difference to your dairy business. Technology has significantly changed the way we farm with a range of stats, analysis, information and expertise at your fingertips. 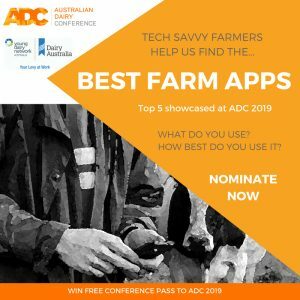 For ADC Canberra 2019 we are searching for the best farm apps used on Australian dairy farms with the top five to be demonstrated at Conference by members of the Young Dairy Network Australia. We want to know what you use, how you use it and why it makes a difference to your dairy business. The app must be an app that anyone can download and use, be useful and relevant on a dairy farm, and be demonstrated how it is used best on farm. So nominate now for your chance to win FREE full registration to ADC Canberra 2019. Just by nominating your favourite app you go into the draw to win a free pass to ADC. Entries close 10 October 2018.